You may call it something different, but every pastor knows about it. It is the mental, emotional and spiritual crash that takes place the next day (Monday) as a result of pouring your heart and soul out in the proclamation of God’s word to God’s people the day before. I know this seems like a “no brainer” for a pastor. The fact is sometimes on Monday morning…I don’t feel like it. Yet, this is still what gives life to our weary souls and we must make ourselves continue to engage, even if we are struggling to want to think about anything, even God and his word. I find pushing through the fog by reaching for the bread of life is what gives a helpful kick start as we begin the weekly grind again. Many pastors take Monday as their day off. For those of us who choose a different day off to spend with our family, we have to proceed with Mondays carefully. I am in no condition to deal with any heavy, thought-provoking, emotional counseling or conflict situations, at least until after lunch. You may be different, but the “hangover” affects us all in some way that requires discernment as we plan the day. Be careful you don’t put yourself in a position in your day that requires you to make a big decision when you are not nearly as sharp as you need to be to make it. I exercise four to five times a week, but if there is a day when it is especially important to do so, it is Monday. If you only exercise one day a week, I recommend it be Monday. It hurts…many times more than normal following a Lord’s Day, but a good 30+ minute cardiovascular workout is exactly what I need to help shake the preaching hangover. 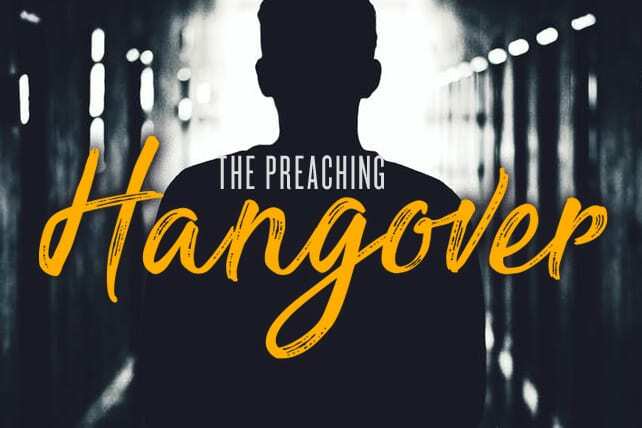 The preaching hangover is by no means an excuse to be a sluggard and unproductive. Give yourself attainable tasks and make sure you push through to achieve them. If it is your day off, make sure you are working hard to perk up and engage with your family so your wife and children do not get your “sluggard day.” If you are trying to be productive in the office, but have a hard time studying for very long as I do, schedule other tasks that are within your frame of mind to accomplish. For me, Monday is full of checking emails, simple administration, running errands and meeting with folks that I know will be more light, encouraging and less likely to be a blind-side confrontation. You may be able to handle more than I typically can. Just make sure they are tasks that are reasonable for you to accomplish in the day. Do whatever you must to provide some silence and solitude for yourself. Sometimes I will combine this with my exercise in the morning. I like to go to a park, run, then sit in silence for a little while away from people, just you and God. Silence can be life-giving when we are often bombarded with words and people the day before. This has become essential for my personal soul care and my ability to work through the Monday fog. I hope in some way these suggestions will trigger ideas that will be of help to you to clear the cob webs of the “preaching hangover.” Just remember, when you do have to face a long, weighty, conflict full Monday because the needs of the congregation demand it…God’s grace is sufficient to walk through it.